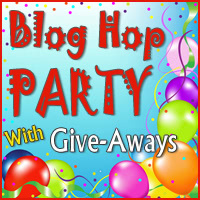 Back to School Blog Hop Party Giveaway! Oh my goodness ya'll!!! Things have been absolutely crazy getting things ready for the start of school. In case you are a new visitor, my husband and I are both teachers in the great state of Texas. I am an elementary music teacher and my husband is a high school economics teacher and coach. Students first day back is on Monday, so this past week has been full of getting our classrooms ready and attending all of our in-service obligations, which means no time at my sewing machine. And in all of the craziness, I almost missed out on the blog hop! But I did pull something together for you guys! Let me give you a little bit of my background. I started sewing/quilting about a year and a half ago. When I first started, I had no idea what my "vibe" was. There is a quilt shop nearby that I found and it is all civil war/reproduction prints, so I signed up for their block of the month. I thought it might be a good way for me to get started, but it didn't work out for me. I am one of those people that needs to be able to read all of the directions before I ever start a project. And with this particular block of the month they sent directions for that month and the fabrics you needed. Basically, after nine months I had all of the fabric but I never started the quilt. And by the end of the nine months, I also had found the modern quilting community and had fallen in love. Now don't get me wrong, traditional can be just as beautiful if not more beautiful than modern quilting, but my personal style leans more towards modern. And as it turns out, my "Project Wish List" is full and I don't ever see myself working on this quilt. I have all of the fabric and directions for the Civil War Celebration Quilt. It is a pattern by Thimble Creek Quilts. The finished quilt should look something like this! I will be sending you all of this! Each month is separated into a ziploc bag with the instructions for that month. The directions state that you can make four blocks out of one month's fabric. And there are nine months all together. Basically, what I am sending you is a civil war/reproduction quilt kit! Pretty awesome, right?! That's it! This giveaway will end September 3rd at 8pm CST. International entries are welcome! Good luck everybody! And make sure you go check out all of the other giveaways as well! I feel like I have been sewing non-stop for the past week! I have been working on a couple of projects that I absolutely wanted to finish before school started back up and I went to work! 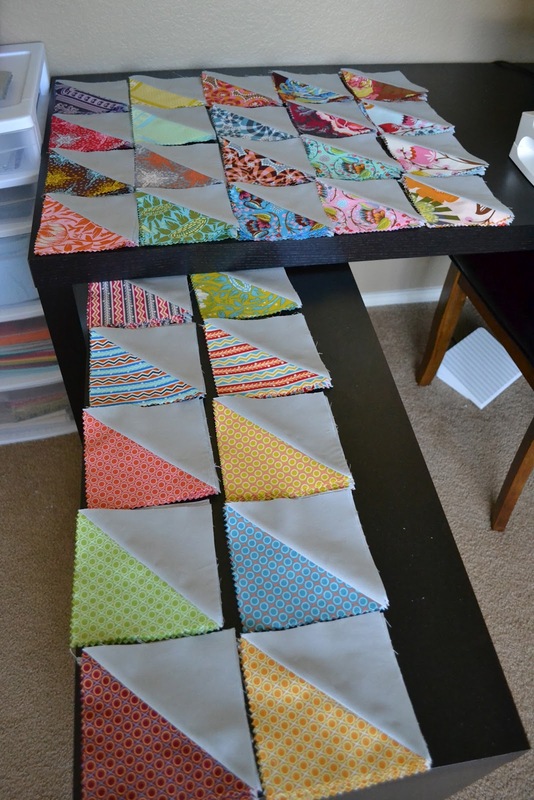 One of the projects was a half-square triangle quilt that I started recently. A couple of weeks ago I stumbled upon some Loulouthi charm packs I had laying around. My brain was swirling with ideas and I decided on half-square triangles. After sewing together about 180 of them, I proposed several layout options to you guys and your help was so appreciated! It was such a hard choice. I absolutely love how the Loulouthi prints pop against the grey! I wish I had enough fabric to make a few of these options but I had to choose just one. I am so excited about this quilt. I am actually in love with this quilt so much that I will be keeping it as my very own!!! Now I have to decide what to use as backing and how to quilt it. It's pretty decent size at approximately 60"x 71". It will be perfect for snuggling up on the couch! Any ideas on quilting .... I have to admit my quilting skills are limited to straight lines at the moment. But I am hoping that will change soon! I have a FMQ practice quilt top that I am piecing together. By the skin of my teeth I was able to enter the Pets On Quilts Show! There are tons of cute pet pics and voting starts today! If you need something to cheer you up or just love animals, you should definitely go check it out! And while you are over there, you can vote for your faves! You all know how much I love my puppies! Well, when I saw that Lily Pad Quilting is having a Pets On Quilts Show I had to join in on the fun! I didn't realize however, that today is the last day to enter .... so if you have some pics of your favorite furry friends, make sure you link them up today! With school starting back up, I have to go back to work next week ... I am trying to savor my last few days of freedom! I hope you all are enjoying the end of summer! I found the most amazing Christmas print and I instantly fell in love! I'm not a big holiday fabric type of person but I love this print! I believe it's an out of print Alexander Henry print. I decided to make some Christmas coasters that would feature the cuteness! I'll be linking this up with Sew Festive Handmade's Christmas in July event.